My chariots arrived today only several weeks later than originally expected and promised (which we all know is great for an Indie ski Co). After taking them out of the box and inspecting them I can say a few things. First these are better made and better finished skis than any Indie skis I have bought in the past. DPS and PM Gear both shipped me skis that looked like they were made and finished in a garage, and the overall quality of construction is way below what Ski Logik has just shipped me (which look much more like they come from a maor ski co factory). The base finish is excellent with a nice structure and the edges are excellent as well. The sidewalls are tightly built and finished beautifully. Second, these skis are softer in the tips than my Icelantic Shamans and for this reason I think they will ski a little nicer (easier and friendlier) in soft snow. Third, the running length is short on these after accounting for how much of the ski is off the snow due to the large twin tips. I roughly measured the running length at around 158cm and ths skis are 188cm. Lastly the tips at 150cm are large but they don't seem as large and clunky as the Icleantic Shamans which are 160mm at the tips. In general I am quite pleased with what I see. It's a very nicely and well made ski and the art/graphic work is spectaular (which we all know from their website). So far it looks like exactly what I am looking for and I predict that these will become my go to ski for fresh snow in Montana. That 15m TR was one of the Key factors in buying these. Obviously only tetsing on snow will tell me what I really need to know, but so far so good. Re: Arrival: Ski Logik Chariots!! Jbotti: As Jim Nabors would say, SERRRPRISE, SERRPRISE, SERRPRISE!! CONGRATULATIONS -- You pulled the trigger WITHOUT DEMOING??!! I thought demo, demo, demo was one of the mantra's? I remember thinking the same thing about the tips and I think that (and the upturn) help make them smoother, but on firm snow they are torsionally stiff and the tips stay connected. What topsheet artwork did you get? FWIW, I played with moving the bindings around on the power rail and am pretty sure that I wound up back at the recommended factory line. Be interesting to hear what you find? Can't wait for your review (I think its been almost 12 months in the waiting stage?)!! I got the standard graphics/artwork. It's beautiful!! Have gotten to ski them yet? If not, when is the anticipated first outing? Unless we get some snow soon in Tahoe, the first time I will ski these will be over Christmas in Montana. I iwll give a full review once I get them on snow. John, good luck. I bought a pair last year based on the reviews from Peter's website. Unfortunately I kept them only 3 weeks and sold them. I thought they would be the perfect PMTS fat ski. They were NOT my cup of tea. Beautiful skis and well made. Everyone I spoke to -- Peter Keelty, Ski Logic's chief ski guru at their headquaarters, their top ski rep in Colorado-- all said it was the tune up. But I had them retuned. Still no help. I also had several of my patroller friends ski them. Same feelings as mine. The problem was in powder and crud - not on the groomed where you'd expect tune issues. I also know they have worked on the tune for this year. My friend is now the local rep in Utah and I'm gong to try his again when he is up here in Idaho this year. Just to see if there was a difference in one pair. Great company and I wish them every success. It may simply be that I prefer a ski not so wide. (my favorite is the Head M78 which I know you like. This year I have a new Peak 84 Pro - ). And in the interest of full disclosure-- I am the local mountain rep for our ski patrol for Head. I also have two pairs of the Scott Missions ( a new one for this year). I'm also the Scott rep. That is a ski that Peter's group only gave luke warm reviews to. But it has a short radius and frankly over the last three years has been one of the most idiot proof forgiving and turny skis I have enjoyed. GReat in powder and crud for me. Yes, I would like to hear more specifics as well. If you read Dawgcathings review of the Chariot with RL (a rockered version of the ski new for this year) he says the ski is way too stiff and because of this it was really not fun to ski in any sort of chop or cut up snow. Is it possible that this may have been the issue or contributed to your issues? I can say from flexing them in my garage that the ski is quite a bit less stiff than my Icelantic Shamans and also less stiff than my K2 Hardsides. Of course flex in the garage doesn't tell you how they will ski, but based upon flexing them they sure don't seem too stiff. I also bought the 188's and it could be that they are more stiff than the shorter 178's but that is just a guess. Did you own the 178's? I will have them on snow in about two weeks so I will defeinitely post a review. 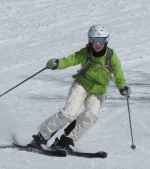 Weather permitting I hope to have a review of the skis in pow as well, hopefully fairly soon. Interesting. FWIW they feel much stiffer and substantial to me on groomed surfaces than powder or crud surfaces. I'm 5'11" and 185 and have (and really like) the 178. Also, the RockerLogik version of the Ullr's Chariot didn't come out until this year -- and it was the Twin Tip version that has gotten all the rave reviews. What were those "Misbeahaven Chariots" doing to ya? Using PMTS skills on big boards while indeed possible, the width of the board up on edge angle can really be a handful. For me as the boards get wider and the conditions are deeper, I utlize more of the base of the ski instead of long visits on high edge angles, the fat skis became more playful and co-operative. More or less, soft edges. My experience with a variety of wider boards found that some when brought up on edge had what I'd call "Turbo Tug"....I had a hard time keeping the edged ski under my hips....that ski just wanted to shoot out from under me and pull away. I'm thinking too if it was a ski that was "A.D.D SKI" ...the skis seemed to have a mind of their own and changed their mind all the time....I'm wondering if binding placement, ball of foot and all that were not placed correctly for you. For me my bad experiences were because the bindings were mounted to far back on a ski making it difficult to engage the shovels. I know I'm shooting blindly here but would be interested in what you actually experienced. This is my experience exactly with fatter skis...except one, the Shaman, which handles higher than normal edges with grace and aplomb (in fact, it demands them). But with my Nomad SFt's, I found they really came to life with softer more drifted approach...actually, Gary, I found the techniques spelled out in a good short book by another renegade Black level PMTS instructor whom I believe you are very familiar with to be the gold ticket to skiing fatter skis in soft snow and tight spaces. That guy's stuff is the most under-appreciated technical thoughts on ski use in the business. More to the topic at hand, I've wondered about the real utility of a 100mm waisted carving ski. I am presently the Ski Logik pro-rep at my own hill, but if I get one of their skis I think it'd be the Rave...15m turn radius in a 90mm ski just seems to make more sense to me. I just tried to talk a fellow patroller (unsuccessfully) out of the Chariot RL's and toward's the TT's based, in no small part, on Dawg's review's. I am interested to read JBotti's assessment of the Chariots---John, did you like your Shaman's (you went pretty crazy long in them, I know Ben Anderson never envisioned that ski ever being that long and still sings the praises of the 161cm..there is 24 year old son (and ex college racer) of a fellow patroller using the 161cm as his full time ski and it is impressive what he can do with them. 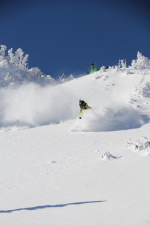 I've only skied the 173cm-in fairly deep powder, and I thought they were great. I am a pretty big icelantic fan, actually...I'd really love to get some time on the gypsy (and see what a real monster ski is all about). Hey Liam....my all time favorite Icelantic ski was the Pilgrim...very versatile ski for me...loved it...actually, I gave it to a relative of mind who also loves it. It was my boot high and above ski for 2 seasons 2 seasons ago. I've only made one run on a pair of Shamans ...not enought to garner a review but it did come up on edge nice but I remember looking down at those "mighty" shovels and man they looked monstrous...but never got in the way. I was this close to buying the Chariot last year when I decided on the Rossi S3. 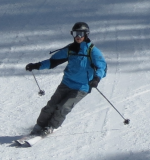 I had a few chances to flex the Chariot's shovel and tail and for what my intended use for them....I just felt at my body weight and skiing style, it felt too beefy. Since our local shop now carries them, I'll be able to demo a pair I hope at our local mountain. I agree Liam...100 underfoot I think is a bit much for the everyday ski ...but I say that considering my skiing style. Heck, I thought the same thing about the thought of going from Head SS, Fischer RX8, Fischer P8's to 78 underfoot in my Kastle MX78's but boy was I pleasanty surprised. Nope...I'm kinda the guy that says give me something that likes a 16m radius or less, easy to bring up on edge and hold there, and doesn't kick the banana's out of me by end of day. Hey guys. This is an open forum -- it's entirely OK to mention the "other Black Certified Instructor" by name. Never can tell when that might be info someone is looking for. I personally hated the Shaman and really do not like the keeper. Both have far to much camber and sidecut IMO and it really limited the speed I could ski where I ski on. The shaman I felt was way to locked on for what I wanted to to do. The Nomad SFT on the other hand is an amazingly wonderful ski IMO it maybe the best non rockered EC tree ski out there. If you go faster you can bend a longer radius into a tighter radius anyways, and if your going slower in 3d environments its hard to take real advantage of the sidecut anyways. IMO most tight sidecut fat skis sidecut only really helps them on hard groomers at which point you have to ask what is the point anyways. I would love to try the Ski logic skis though just never had a chance to demo. Well a few folks have asked about how the ski felt. Max501 and I have previously exchanged a couple of messages on this on the PMTS forum. On the groomed I was acutally pleasantly startled and liked it. My thought was for such a fat ski it was quite turny (and I expected that due to is short turn radius) and it had a lot of edge hold. Initially, it was a little too sharp, but that was esily correcgte and that can largely be a matter of personal taste. In pure powder also liked it. Nice wide ski, nice and turny. It was when the powder began to get chopped up - and in today's world that is pretty quick, or turned heavier - let's cal lthat crud--that my opinion changed. It was just beating me to death. If it hit a clump or a rut it wanted to change direction RIGHT NOW. I felt as if I was constantly struggling to have it go where I wanted it to. I was bounced all over. It flat wore me out. And no, I wasn't trying to muscle it. And it was for the deep stuff and crud that I wanted the ski. A fat ski capable of applying PMTS principles.